I’m a firm believer in a good, regular closet clean out and I try to do it about every two months or whenever I feel it is necessary. Having my closet stuffed with clothes I don’t want to wear or haven’t worn in forever just makes me feel bad about my closet and I’m that much more inclined to shop rather than trying to put together looks I already own. I know people can have emotional connections to clothes and there are certainly pieces I have in my closet that I can never get myself to get rid of (bachelorette outfit, wedding shower outfit, an LBD with the tags still on that I’m convinced I’ll have somewhere to wear one day), but if your closet is really in need of a clean out, you really need to remove those emotional ties and move on, otherwise your closet is always going to be stuffed with pieces you don’t ever wear. 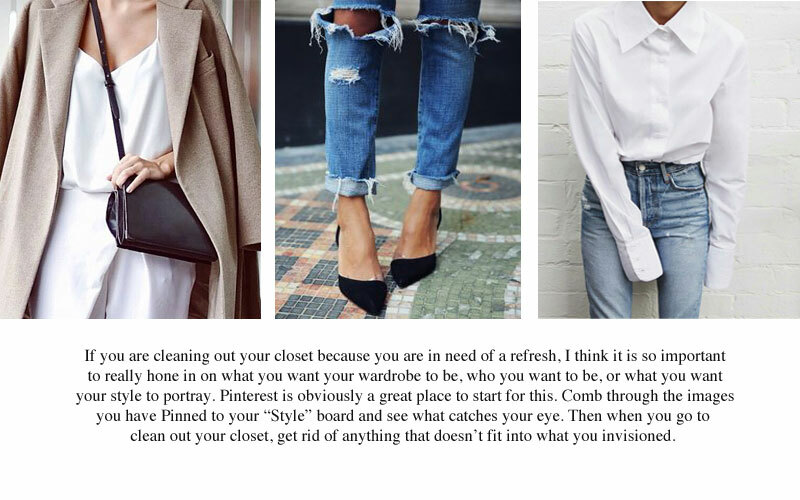 Interesting tip about changing the organization of the closet to inspire new outfit pairings! I also tend to organize by sleeve length or clothing type (all the sweaters together, all the dresses together, etc.). May switch it up next time I clean out my closet! My closet is in dire need of a clean out. There are just those certain pieces that even though I don't wear them, I can't seem to bear to let with them either! Yes! I agree with everything you've said here, Shannon. Last year, I switched over to all wood hangers and it is amazing how quickly that can transform a closet into our own little boutique. I also invested in some white shelving so I could fold many of my pieces that were getting shoulder puckers from hangers. And for shoes…shelves are a must for showcasing shoes. Honing in on our style is absolutely crucial! As I mentioned in a post last week, I've actually started getting rid of every item that doesn't make me feel my absolute best. Less really is so much more. This is a great post…this is such a life changing message to pass along, and I love these kind of articles and photos! These are great tips. I HATE cleaning out my closet. I did am major clean out before we moved, and I got rid of tons and tons of stuff (mostly so I wouldn't have to pack it). I just get so overwhelmed when I do it! Plus, it takes me sooooo long. My closet needs a serious overhaul and I can't wait to tackle it. These tips are spot on! YES! I can't wait until I have some free time to tackle my closet! Right before I moved, I did this!!! I put everything in these piles and totally cleaned out my closet!! It was AMAZING. Great tips! I'm long overdue for a closet clean out! Oh gosh, I have literally had "clean out closet" on my to-do list for weeks! I really need to bite the bullet and just do it! I need to do one of these. In fact, it's dreadfully long over do. These are great questions to ask myself. 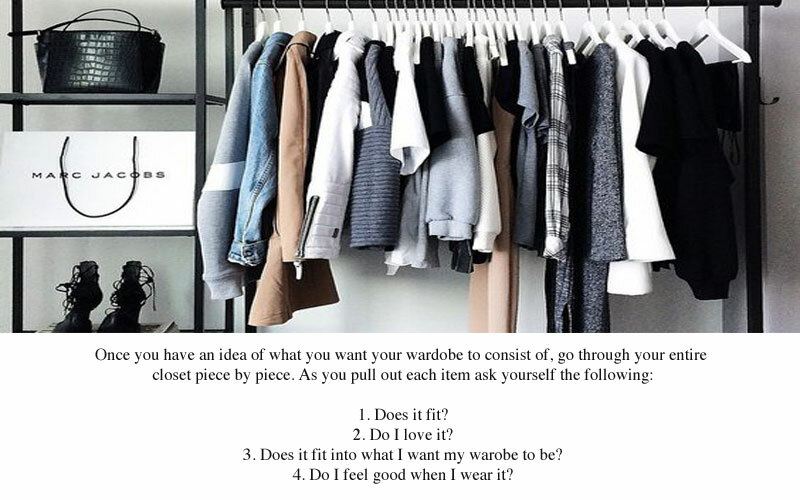 For awhile the "what do I want my wardrobe to be," aspect was the biggest thing holding me back. My weekend style and office style are so different that it's super hard to find a medium and feel "me." I can totally relate Kiki! Thankfully my office is pretty much rid of a dress code now (I mean you need to look nice), but it's still a struggle to find that balance.